It was mesmerizing--the falling snow coming right at us, illuminated by the snowcat's bright headlights. This was my first mission in the midst of a blizzard. My hands were cramping as I held the cat's steering and breaking levers too tightly. Maneuvering the tank-like machine was easy enough, especially given our top speed of about 10 miles per hour, but adrenaline was making me lean forward, stiff-backed, gripping the controls as if the extra effort on my part would help the beast push through the fresh, deep snow on the long incline. Over the din of the engine, I could hear bits and pieces of radio traffic, as we followed the tracks of our two teammates on snow machines, who'd gone ahead to locate the subjects' vehicle. We were looking for two overdue hikers from Tucson, a male and female ages 26 and 21. They'd set out for a multi-day backpack on Thursday, due to return on Sunday. When they began their hike, the skies had been sunny and clear and the temperature seasonably warm. On Saturday, the mercury had plunged and the snow had begun. By Sunday, the storm was full-blown with a thickening white blanket on the ground. On the afternoon of Tuesday, December 16th, the call came for search teams from both Coconino and Gila counties to look for the missing couple. The Mogollon Rim is a rugged escarpment that forms the southern edge of the Colorado Plateau, dropping as much as 2,000 feet in some areas. The twosome's intended route would have taken them in a loop both above and below the rim, a trip of about 50 miles in the Forest Lakes area of Northern Arizona. A forest ranger had seen the couple at the beginning of their hike above the rim and knew the location of their vehicle, which they'd parked at a primitive campground near Bear Lake, about twelve miles from the nearest paved road. As of Sunday, that vehicle was still there, but the hikers were not. With Coconino County being so large--over 18,000 square miles--and much of it very remote and accessible only by Forest Service roads and rough two-tracks (if by vehicle at all), our team sometimes has to travel several hours to reach the staging area for a search or rescue. Today, the weather and driving conditions slowed us down even more, so, by midnight, we were still trying to reach the missing hikers' Volvo, the first place our coordinator decided we should check. Earlier in the evening, Gila County SAR had been searching below the rim but had come to a swollen, fast-moving creek they'd been unable to cross--a creek which likely had been easily crossed before the storm. Our snowmobilers were having some difficulty locating their turn-off in the current white-out, as the four of us in the snowcat made our way in that direction. We'd be continuing further along the Rim Road, the hikers' intended return route to their vehicle. After checking the car, part of our team would then search a nearby powerline. We potentially had a lot of ground to cover, and a call-out for more volunteers and other resources had already been made for the morning. Also, two members of our group had stayed behind at the staging area to rest; they'd probably be going out on snowshoes if the hikers were not soon found by the snowmobilers or those of us in the cat. I wondered if I too might end up snowshoeing, which I was more than ready to do. I glanced at the gauges often as I drove, primarily checking the RPMs as I'd been instructed. I was also watching our fuel level. Wow, that machine was really eating up the gas. We noticed a fire tower just off the road and backed up to check it out. It was difficult to see much of anything not directly in the path of our headlights, so we'd almost missed it. As we pulled up to the small outbuilding near the tower, Art decided to jump out to take a closer look. He sunk to his waist in the snow! I can't imagine anyone walking very far without snowshoes, which we know the two hikers didn't have with them. We were quite sure they were not on the move. And that assumption proved correct. Just as Art signalled that no one was inside or behind the outbuilding or around the tower, the snowmobilers announced they'd located the vehicle and the subjects with it, code 4. Phew! Turns out, the hikers had taken a shortcut when the weather started to turn, but that shortcut had proven more difficult to locate and hike than expected. They'd arrived back at the Volvo on Monday after ten hours of hiking that day, but, due to the depth of the snow, could no longer drive out. They'd been at the car for thirty-six hours by the time our team located them, passing some of the time playing cards, strumming their ukulele and making up songs, and staring out the window at the falling snow, waiting and hoping someone would eventually rescue them. The couple had some things in their favor despite their predicament. For one, they'd left an itinerary with a roommate, so Search & Rescue teams had a good idea where to look right from the beginning. Even if hikers leave their planned route, either on purpose or unintentionally, having the itinerary means SAR personnel are able to make educated guesses on the most likely places they may have diverted. Also, the couple did have some basic essentials, including a backpacking stove, a pot, fuel and fire starter with which to melt snow for drinking water. They had warm sleeping bags, pads, a tent, and light sources. (Not to mention the ukulele, of course!) They had brought a map, which, though printed from the internet and somewhat lacking in detail, did help them locate a shortcut to their vehicle. There was no cellphone reception; however, had they turned on their phone at some point, special equipment requested by our coordinator could have determined their actual location, if I understood that correctly. I also understood that that equipment would be available sometime on Wednesday. In addition to gear, the hikers made the right decision in staying at their vehicle and waiting, rather than making an attempt to walk out. If they'd tried to walk out in what I believe was about three feet of snow, fatigue and cold could have--and likely would have--really put them at risk, despite being young and fit. Althooooough ... parking about twelve miles from the nearest paved road when there's a major winter storm coming in wasn't exactly the best decision. But I sorta think they won't do that again. That is, after they eventually get the car back. Their poor little Volvo is probably going to spend a long, lonely winter on the Mogollon Rim. On this rather rare occasion, we have a chance to read about the mission from a "subject's" perspective. 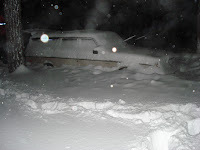 Read hiker John's firsthand account of getting stranded then rescued on his blog. Also, check out these photos, taken by the hikers, including before and after pics of their vehicle: Click here. "Overdue Hikers Missing Near Forest Lakes"
Wow! Amazing story. Congratulations on a job well done. Thankful that the couple made more of the right decisions than the wrong ones.